This week another milestone was reached. The basic bench work has been added which will eventually take the track into Eastport. The next section of backdrop is due here any day now and will be added when it arrives. I realize this is not any kind of earth shaking event to you readers of this blog. 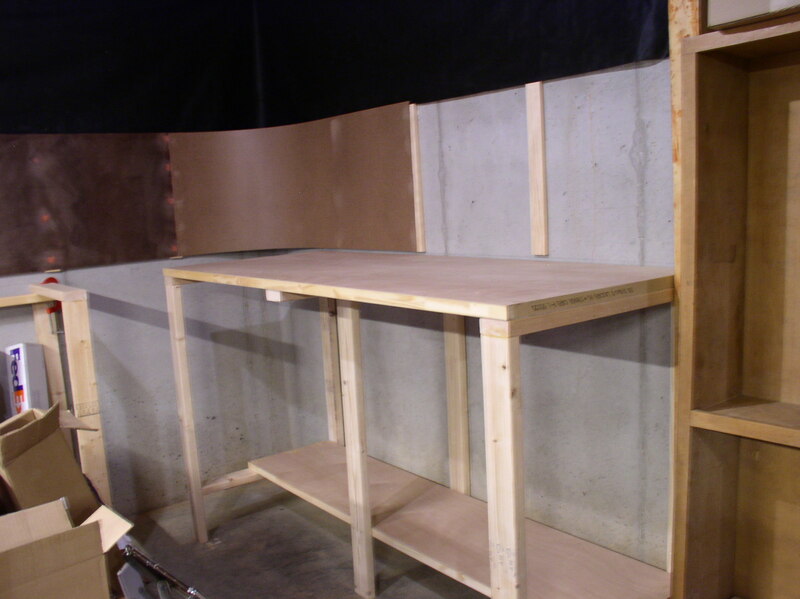 The bench work is obviously high as has been discussed before, and a shelf has been placed underneath. The shelf is very important to me because it creates some needed storage space. One of the very real problems that I have is that when I moved to SC, I brought as much in the way of materials and structures as I thought I would need. All of it needs to be stored away to give me space in which to work. As I move around the room I am displacing my stock and have to find new storage space for it. And, just to keep things interesting, I sometimes lose track of certain necessary items, in spite of having most things in well marked boxes. In any event, there is a lot of shuffling from one shelf to another. So, when I create a new shelf, it is a big deal at least temporarily. This point in the construction also means a change where I will be moving from a backdrop to bench work that will be two sided instead of one side being a concrete wall. From here on out the bench work will angle out from this point to serve as a free standing area that will be accessible from both sides and eventually the end. As much as I have been delighted with the photographic backdrops, I will not be able to continue. Eastport will be fairly wide and parts of it beyond my reach unless I expose both sides. I still plan to operate only from one side, but the scenery will need additional access. While getting into this project I had still not addressed any kind of solution. 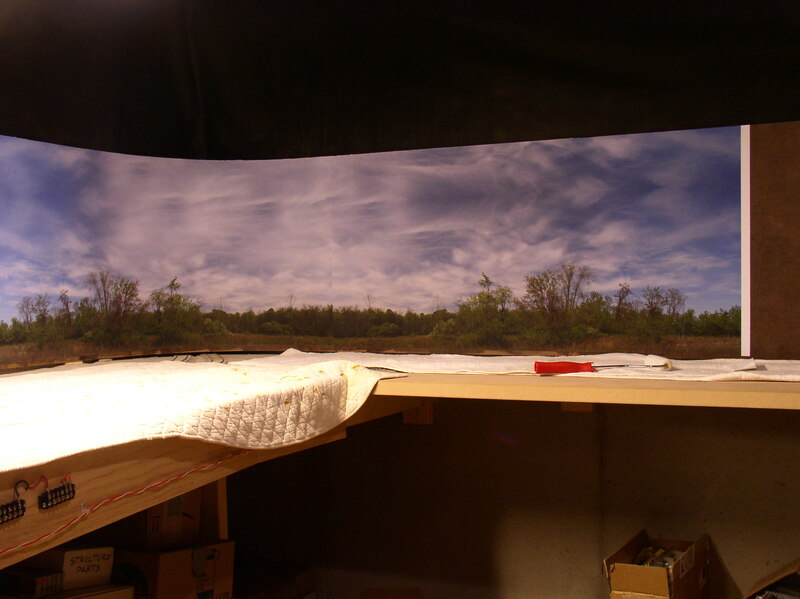 Then along comes Trevor Marshall’s Port Rowan ( http://themodelrailwayshow.com/cn1950s/ ) with a flexible backdrop. It was such an obvious solution! If you will note in the photo, above the Masonite panel where the photo backdrop will be applied there is a black area. The black area is a long sheet of very flexible garden fabric which is very easy to hang. It is a light weight material, but because it is against a wall, no light shows through. I may have to double it to block light from behind Eastport. I also plan to use the fabric below the front fascia to shield the shelves and provide a contrast in order to showcase the railroad. A friend in MA introduced me to this fabric originally. He uses it as a drape to shield the underside of his layout while at the same time providing easy access when needed. Today I added another section to the Ayers Junction backdrop. Now when I stand in front of Ayers I am enveloped in the scene. The next section that I am waiting for will transition from Ayers Junction to Eastport itself. The backdrop will include the end of the wooded scene shown here and will blend in a bit of Passamaquoddy Bay that was characteristic of the view just prior to reaching Eastport. I wasn’t sure when I started this part of the project that I would be able to include this favorite scene. But thanks to Dave Burgess’ handy work in being able to photographically blend the two images, one his and one mine, I think it can be achieved. In trying to set the image of coastal railroading, this will be perfect for me. The railroad itself, in passing from Ayers to the ocean, must pass over the Pennamaquan River Before reaching the coast. I don’t have much space to work with in this very condensed scene of the trestle, but we will give a major try. You can see the scene at the very beginning of this blog.